From centers of tomatoes, cut eight 1/2-inch thick slices and four 1/4-inch thick slices. Coarsely chop remaining tomatoes; puree in blender with salt and 1/8 teaspoon of the pepper. On small plate, spread out flour. In a small bowl, beat egg. In a second bowl, combine panko and Parmigiano-Reggiano. 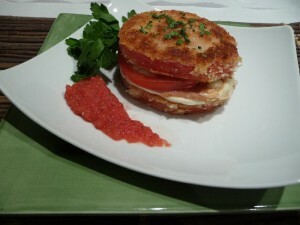 Dip both sides 1/2-inch thick tomato slices first in flour, then egg and then panko mixture; set aside. In large skillet over medium heat, heat 2 tablespoons of the oil. Add breaded tomatoes; cook until golden on one side, about 2 minutes. Add remaining 2 tablespoons oil, turn tomatoes and cook until browned on the other side, about 2 minutes. Remove tomatoes to paper towels to drain. Preheat broiler. On a rimmed baking sheet place 4 fried tomato slices. Top each with a piece of mozzarella, 1/2 slice prosciutto, a 1/4-inch thick tomato slice and 1 tablespoon gorgonzola; sprinkle with the remaining 1/8 teaspoon pepper. Broil, watching continuously, just until the cheese begins to melt, about 2 minutes. Divide tomato puree onto 4 plates. Place a broiled tomato stack in the center of each and top each with one of the remaining fried tomato slices. Sprinkle with parsley and serve.